Usually when animals change color, it’s to avoid predators or to become more appealing for mates. 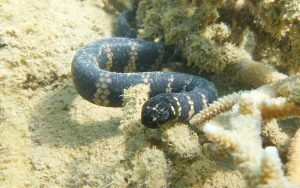 But faced with the stress of urban life, turtle-headed sea snakes in the Pacific and Oceania lose their stripes, as a way of purging toxic chemicals from their body, according to a study published Thursday in Current Biology. Australian ecologists found these striped snakes cope with excessively polluted waters by losing their white stripes and sporting a solid, black coat. This ink-colored skin soaks up harmful contaminants, which are then purged when the snakes shed their skins. “It is a spectacular example of how animals are able to evolve very rapidly to deal with the new challenges that people are imposing on ecosystems,” said Richard Shine, a study co-author and evolutionary ecologist at the University of Sydney. For the last 15 years, Shine has spent his family holidays on the the Pacific island of New Caledonia, a location where he can step outside his hotel and collect sea snakes. Every morning, he dons his wetsuit, grabs a French coffee from the cafe and walks 50 yards to a colorful reef, abundant with sea life. There, a stone’s throw from the booming stereos, busy roads and city life, he conducted a study of the turtle-headed sea snake, which lives in coral reefs near Australia and the Pacific islands. One day, Claire Goiran — a University of New Caledonia marine biologist and Shine’s colleague — noticed the snakes near an urban area and near a military bombing range were all black. Goiran read a study where pigeons in France shed pollutants, such as zinc and lead, by trapping them in pigments in their dark feathers. She wondered if the same might apply to the sea snakes, given studies had found high pollution at those two sites. So the team collected 48 freshly shed skins from all-black snakes living near the urban reef and from striped snakes near the the university’s less urban campus. They then measured the level of toxic chemicals in the discarded skins, comparing urban versus rural snakes and dark versus light stripes. They found that snakes in the urban reef had higher concentrations of toxins than snakes in remote areas. But even within the same snake, the darker skin trapped more pollutants. 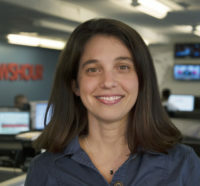 Rutgers University biologist Joanna Burger said this is the first example she can recall in which skin color was so important for sequestering toxins. But Burger wasn’t surprised. Snakes often use their skins to store toxins, she said, and adding that snake eggs and human hair are also avenues for shedding toxic metals, like arsenic or zinc, or pollutants. University of Florida biologist Harvey Lillywhite said this sea snake saga is a good lesson in industrial melanism, a term that describes the prevalence of darker-colored varieties of a species in polluted areas. Starting during the U.K.’s Industrial Revolution, for instance, moths turned gray to better camouflage against trees blackened by soot from factories. Shine said solid black skin can fight more than just pollutants. 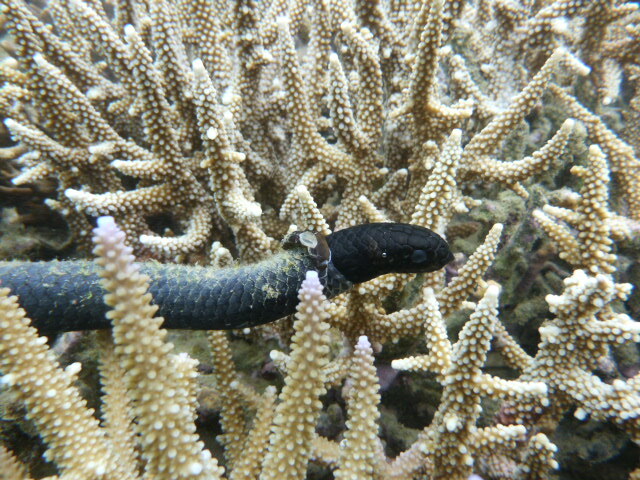 Dark colors attract algae, and in previous work, Shine found turtle-headed sea snakes without white stripes tend to accumulate more algae growth. This algae slows down the serpents’ ability to swim, making the snakes shed their skins more often. “It’s getting rid of things that otherwise might interfere with its viability,” Shine said. Even though the snakes are losing their white stripes, Shine sees a glimpse of brightness. “I think it’s an encouraging story in that we put these poisons into the water and low and behold, [the] snakes turn out to have a pretty good mechanisms of dealing with them,” he said.